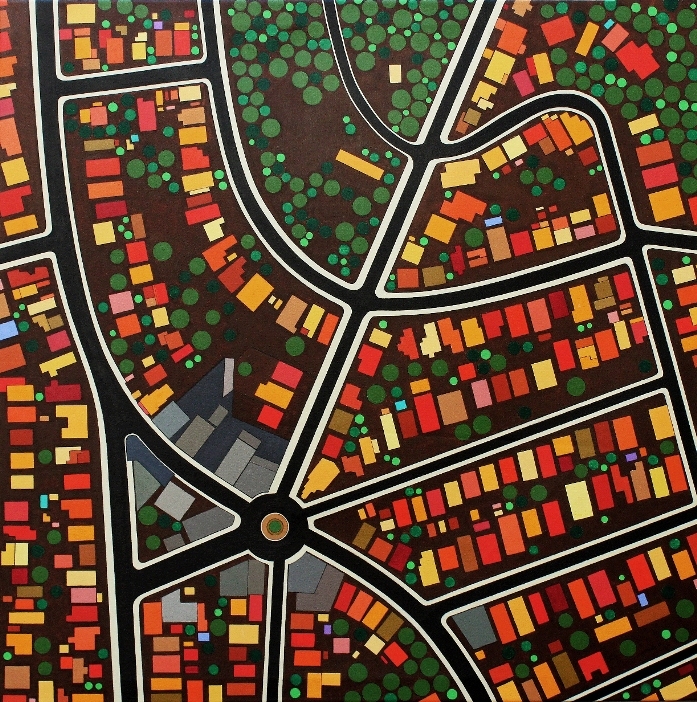 2019 brought forth a new series of paintings within City Synthesis. 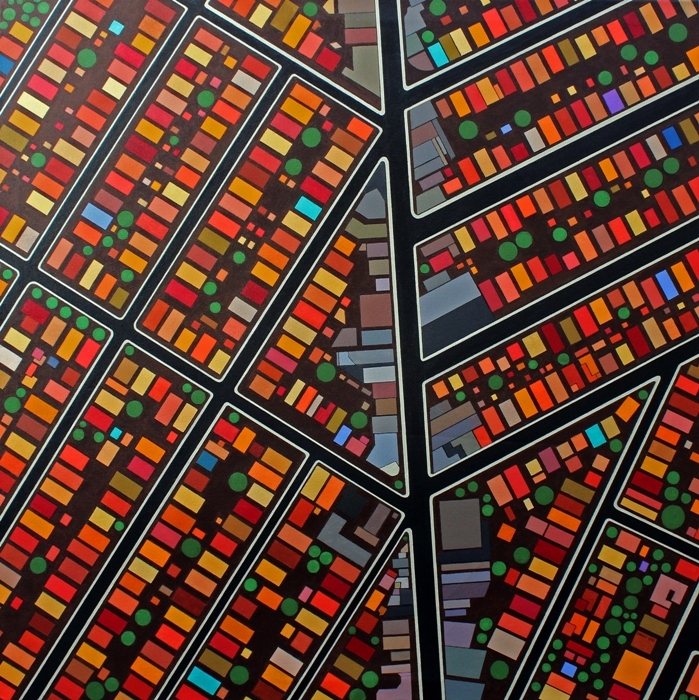 The Resonance Series is of cities and landscapes using the earlier geometric studies of square, rectangle, stripes, and circle. Reduced to the basic shapes and with a satellite perspective, the real terrain becomes abstract. 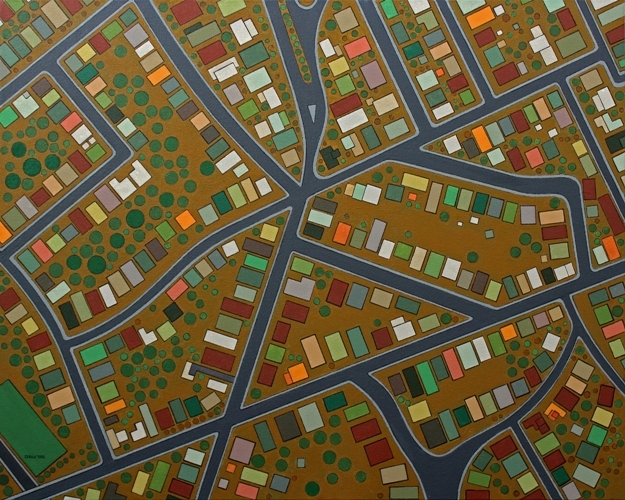 The foundation group of five works provide the scope of study, urban to rural. The subdued Familiar Terrain is the prototype experiment; its pattern is a short distance from where I live in Oakland. The curves are in contrast with Rockridge with its bold straight lines and colors. The business street is College Avenue, which extends from the California College of the Arts in Oakland to the University of California in Berkeley. 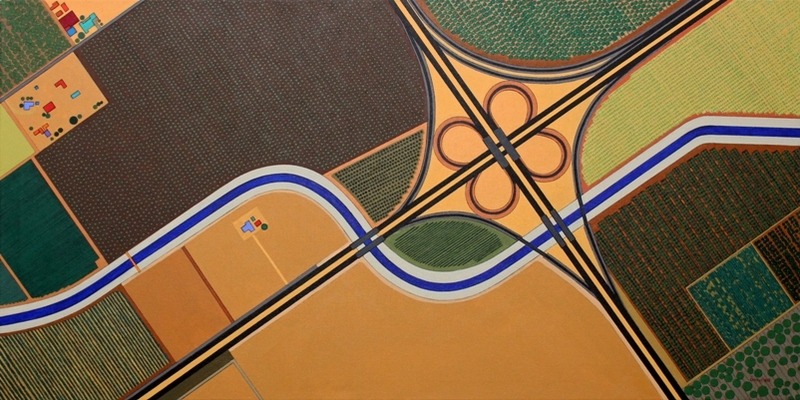 West of Modesto is site of a rare highway cloverleaf in California and is an agricultural area near the Bay Area. 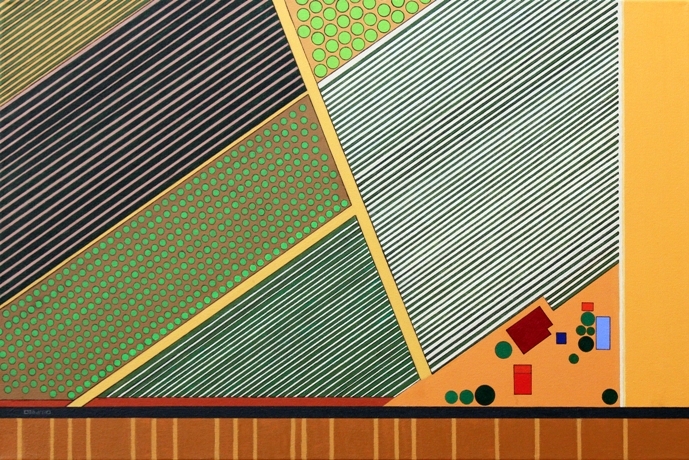 The rural theme continues with the simple lines of a Central Valley roadside farm, Barstow Avenue, and the last of the group, Kensington Circle, is again intricate with another view of a nearby California city, with its rooted circle and menorah or treelike outgrowth. The first painting of 2018 is companion of Tempest, noted below. Central Asia is the title. Is the wavy line at the bottom an upper river bank or the river itself? 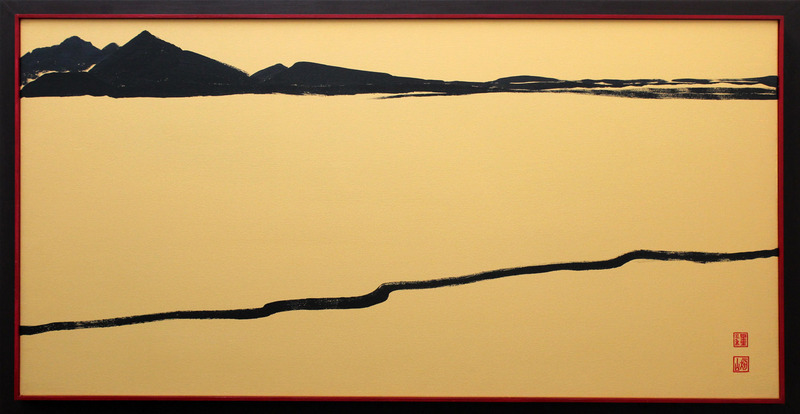 The ambivalent scale of the work – close by or distant?– reflects how distance estimating by sight in a desert expanse is often mistaken. 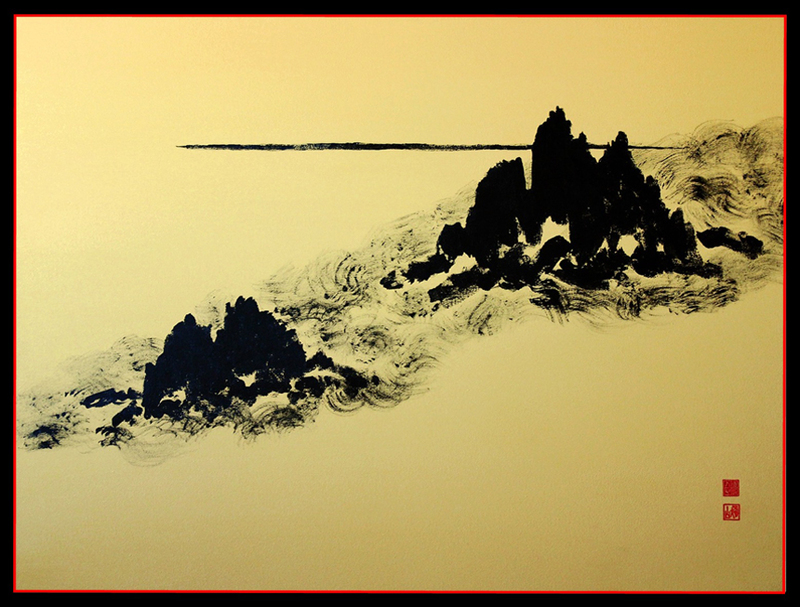 The third of the quartet group of Zen sumi-e inspired painting is Plunge. 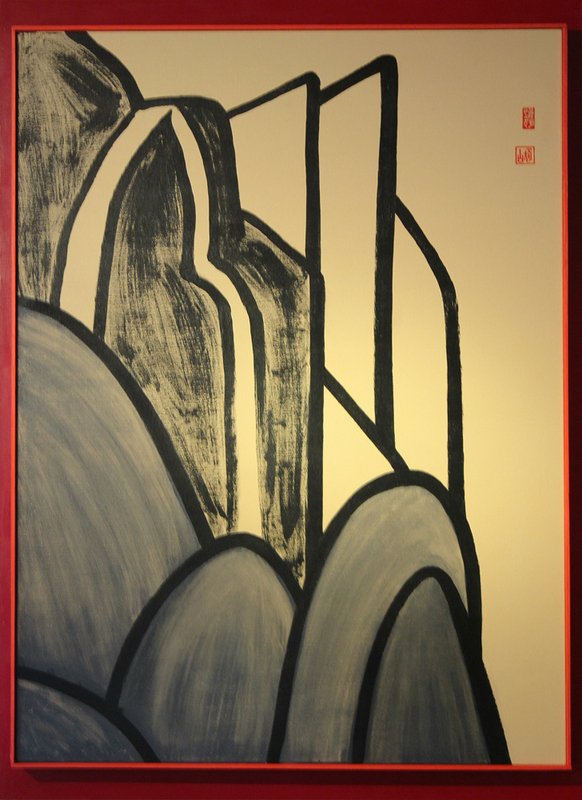 The work seems to be a meeting of Korean Zen painting and 20th-century Modernism. The frame (plywood is used) is integral to the painting; such is the case in the other works of this group. 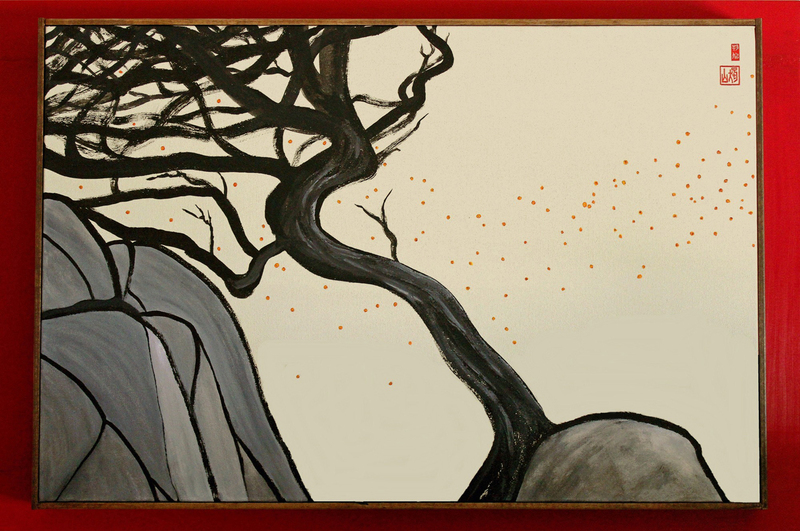 Fire on The Mountain was inspired by Japanese painter Takehiko Sugawara's increasingly abstract series of works on an old cherry tree that I viewed at the recent SF Art Market and also via the internet. A Monterey cedar was my own model. 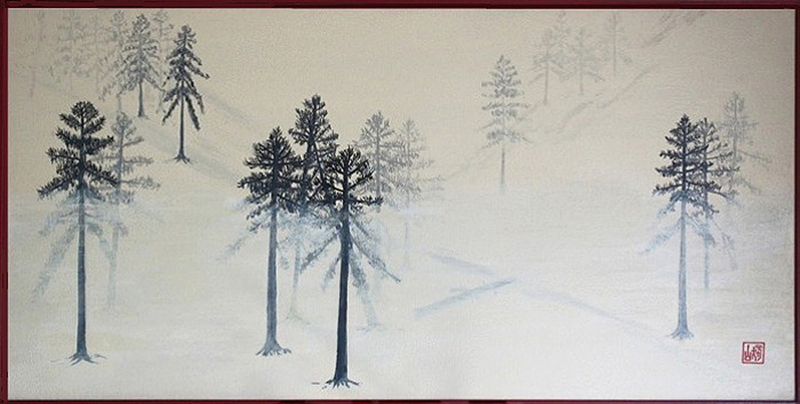 Another East Asian style painting is Morning Pines, which is influenced by Hasegawa Tohaku's Pine Forest from the 16th century. This page features the latest v0isual compositions, completed in 2018 and early 2019. Because the page will change with each new opus, monitor the page periodically. The images may also be found among the galleries. NOTE: All reduced and overly processed images fail utterly in even hinting at the quality and the true colors of the actual paintings and their effect on the viewer. Memories of Brazil is directly taken from a cropped photograph Bibel took in Paraty, relaxing on a hammock a sultry afternoon. 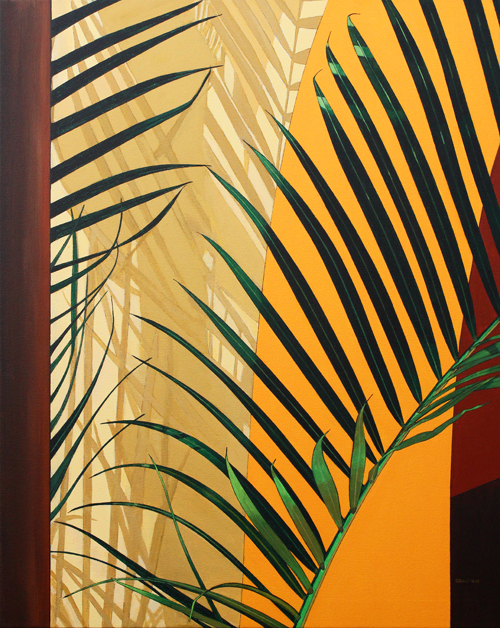 Other than the inkwork Ambiguity, the spindle-shaped palm leaves is a morphological pattern she has not previously painted. A psychological aspect is recognized, fear or repulsion grounded in evolution, as the series of long extensions recall centipedes, spiders, and long-legged insects. On the other hand, they also resemble the teeth of a comb. Tempest is the final painting of 2017 and is modeled on Study 3 of Form & Flow Despite the hue differences, the painting background is in confluent Naples Yellow. Note: This image is a very poor approximation of the subtle quality and hue of the actual painting.